Nurses take our lives into their hands daily. Thousands of patients pass through bustling hospitals waiting to address their various ailments with one of the world’s most in-demand professions. Doctors rely on them, clinics and hospitals can’t operate without them. Nurses deserve our appreciation, gratitude, and proper access to mental healthcare to address their own needs. Suicide is an epidemic among healthcare workers, especially nurses. 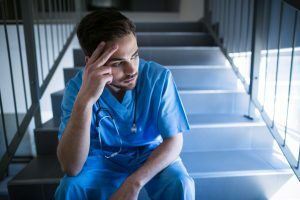 Long hours on their feet, limited breaks, and plenty of time spent in a stressful environment away from anything of comfort may be a necessary part of the profession, but it is costing them their lives. The problems faced at work caused by a lack of sleep and stress do not simply end there. Over 44,965 people died by suicide in 2016, making it the 10th leading cause of death in the nation. There were 395,000 self-inflicted injuries and 1.3 million suicide attempts. Nurses were often at the forefront of helping save lives, processing attempts in the emergency room. But how many of us have brushed off scars as patient-inflicted injuries, or teary, sullen eyes as “hazards of the job” while under a nurses care? Without hard data to determine how many nurses fall victim to a lack of action in a culture of silence, we must focus on prevention. A study on workplace wellness reported that nurses felt cared for when their leaders saw them as whole people, not simply a tool in the workplace. To an employee already facing an uphill battle with mental health, this could be the difference between life and death. Workplaces need to show nurses that they are just as valuable when they become patients as they are as workers. They need compassion, suicide screenings, positive reinforcement and shorter shifts with proper breaks so a lack of sleep doesn’t affect their mental health further. Nurses are people, just as mortal as anyone in the Emergency Room. Healthcare providers should take heed to care for their employees in order to keep beds empty, nurses happier, children with parents and most importantly: to save lives. Nurses do so much for us. They deserve to have the favor returned.